These beautifully Embroidered Personalized Grandma Shirts create a unique way to display the love you have for your children. This adorable design is skillfully embroidered onto your sweatshirt to make it a wonderful gift like no other. Surprise your Mom, Grandma, Aunt or anyone who has your heart with this special Personalized Sweatshirt on Mother' Day, Grandparents Day or their birthdays. Your Embroidered Grandma Sweatshirt is available on our premium white, pink or ash gray, cotton/poly blend sweatshirt, machine washable in adult sizes S-3XL. 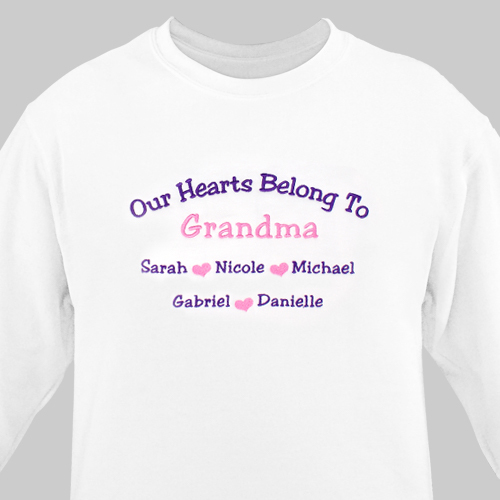 This Personalized Sweatshirt is perfect for mom or grandma and includes FREE Personalization. Personalize your sweatshirt with any title and up to 12 names. This shirt turned out so much nicer than I expected! Can't wait to wear it and show it off. Love this sweatshirt. Had one made two years ago, and another just recently. Great quality. Upon receiving my sweatshirt, I noticed that one of my grandchild's name was misspelled. I called, they put in a new order for a replacement (the fault was with them, not me). I am waiting on that, but I am very satisfied with their products and customer service. Beautiful. Nice weight to sweatshirt. Would definitely use them again. Our New and Exclusive Embroidered Sweatshirt is the perfect gift to show someone they mean the world to you. Give this unique and one-of-a-kind Embroidered Sweatshirt to Grandma, Mom or anyone special on your shopping list. Also our Embroidered Our Hearts Throw Blanket makes a wonderful addition to this fantastic sweatshirt. Honor any special Mother in your life with our collection of Personalized Mother's Day Gifts. We have a great variety of Personalized Gifts for Her, Engraved Keepsakes for Her and so much more.